The Most Impressive Home Run Hitter in Baseball History? He Ain’t American! When you talk about the greatest home run hitters of all time, there are many names that come to mind for most Americans. Babe Ruth probably comes to mind first, as he was the first to hold the impressive single-season home run record, with 60, for a very long time. Many might remember that Roger Maris broke that record and that his record was later broken by Mark McGuire and then Barry Bonds. You might also remember the impressive overall home run record that has been held by Hank Aaron. What you may not know, however, is that the man with the most home runs ever was not from this country and barely speaks English. His name is Sadaharu Oh and, in case you could not guess from his name, he spent his career playing in Japan. Just how impressive has his home run output been? Well, you may remember that Hank Aaron had the overall career home run record in the United States with 755. Sadaharu Oh has him beat by an additional 113 home runs. That’s right, Oh’s final tally of career home runs is 868. Oh began his career in 1959 when he signed with the Yomiuri Giants. He started out as a pitcher, like many sluggers, but he was not a strong enough pitcher to continue as one for very long. He eventually switched to playing first base and that is where he stayed throughout his career. That same year he began working laboriously with a hitting coach to improve his skills. Whatever that coach must have said to him, Oh took it to heart. While playing with the Yomiuri Giants, and switching to first base, the team won an impressive 11 championships. Two times he won the Japanese Central League’s batting triple crown twice. He began pounding out home runs at a steady pace and led his league with homers fifteen times during his career. He also drove in the most runs for a staggering thirteen seasons. He became the biggest dominant force in Japanese baseball for a long time. The impressive thing about Oh was that he was not just a power hitter. He also was the batting champion for the league five times. He was named the overall MVP of Japanese baseball nine times during his career. He was elected to the All-Star time an impressive eighteen times. Oh was impressive for a number of factors, including his position in the batting order. He batted third with another dangerous hitter named Shigeo Nagashima hitting just behind him. Pitchers had trouble determining what to do with him when he stepped up to the plate. Once he retired, Oh went on to become a manager. He stayed with his team and became the manager of Giants from 1984 to 1988. In that time he led the team to the Central division championship once. 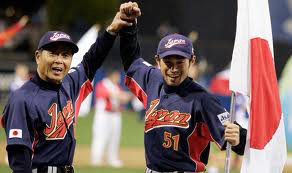 He continued to manage teams, winning more championships and even managing the Japanese national team in the 2006 World Baseball Classic before finally retiring from baseball all-together in 2008. These days Oh is still active in baseball, although he is not on the field as he once was. He is currently the General Manager for the Fukuoka Softbank Hawks. He is also involved in several baseball organizations that promote the game for young players in all countries. He and Hank Aaron created the World Children’s Baseball Fair for this purpose. In recent years, Oh has battled cancer, but he continues to go strong and works hard for the sport he has loved his entire adult life.